Height of the tyre sidewall as a percentage of the width. In this case 55% of 205mm. Also know as the aspect ratio. Speed Rating. Indicates the maximum speed for the tyre when at full load. In this case 168 mph. 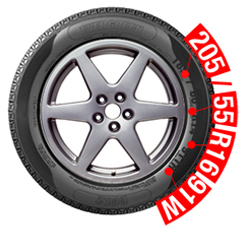 ECE type approval mark, which demonstrates the tyre has been tested as high quality by the European Regulatory Authorities. All Tyres sold by Dawson Tyre Services carry this mark. Retreading and Regrooving commercial truck and PSV tyres makes sound economic sense. However, precautions must be taken to ensure that the process leads to safe tyres. Regrooving should only be done by a fully trained, professional operator. Manufacturers provide regroove tread patterns for their tyres. It is illegal to recut a tyre to any tread pattern other than that shown in the manufacturer's regrooving manual. Re-grooving of tyres should be carried out when the depth of the original tread has worn down to between 3mm and 4mm and in accordance with manufacturers' recommendations. After regrooving, a tyre must be free of any defects, cracks, separations or exposed ply or cord. Only tyres in good condition can be regrooved: When a tyre shows signs of irregular wear, perhaps through incorrect wheel balancing or steering geometry problems, it should not be re-grooved. Always check the tread depth at several places around the tyres and make sure all regrooving is based on lowest depth found. January 2005 saw the introduction of EC109 Standard for Retreading introduced. The new standards require the compulsory testing of retreads and remoulds similar to standards set for new tyres. There is a strict British Standard for tyre repairs (BS AU159c), which means any repairs must be carried out by a professional operator. When a tyre is punctured or damaged in any way it must be carefully examined on the inside to make sure there are no hidden faults. Damage is not always apparent from a casual examination of the outside of the tyre. If you suspect damage, internal examination must be carried out. Externally applied plugs and sealants are out. No tyre manufacturers accept responsibility for problems arising from their use. Tyres do deteriorate with age. This shows as cracking of the sidewalls of the tread rubber. Bad suspension alignment can lead to drastically uneven wear. Another cause of unnecessary tyre deterioration is bad driving. Riding kerbs, excessive braking and harsh cornering all lead to expensive tyre wear - bad driving costs money.